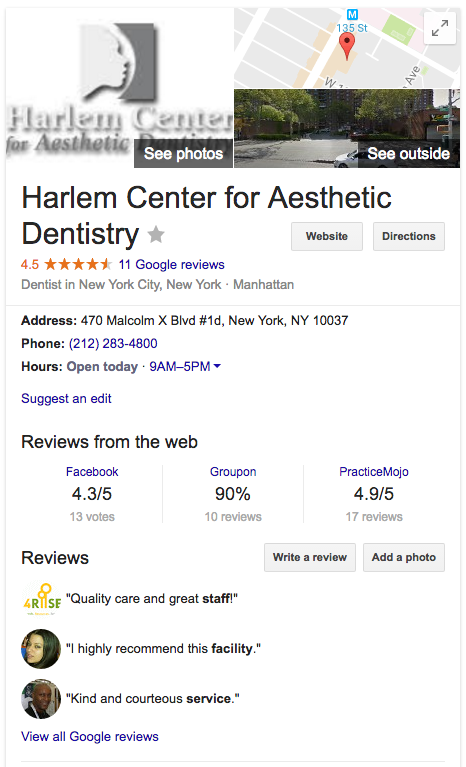 Google’s New Review Feature: How Does It Impact Dentists? A recent Google update directly impacts dentists and their practices. Google now incorporates “Reviews from the web” in their knowledge panel for businesses, including dental practices. The knowledge panel is a box of information that appears on the right-hand side of Google search results. It contains information relevant to your business and services that is pulled from your Google My Business account and other third party sources. Previously, only Google reviews appeared in the knowledge panel. With this update, Google will be filtering reviews from a variety of websites, such as Facebook, Healthgrades, PracticeMojo, and others. This update directly impacts dentists, as smaller and more niche review sites will gain more visibility across Google. This opens a great opportunity for dentists to further refine, manage and evolve their online reputations. It is possible that there are online profiles for your practice that you are entirely unaware of. Stay on top of your online reputation and online reviews by searching for your practice on Google, to first see if it has started pulling third party reviews for your practice. Go through the search results for your online profiles and websites that may already house reviews for your practice. If you want to take your online review management to the next level, there are several reputation management systems available that will automatically pull and filter your online reviews. Now is the time to promote collecting as many positive reviews as possible on each of the platforms that come up for your practice, as opposed to just Google or Yelp. Each positive review will help to dilute any negative reviews and build your overall positive reputation.